Dr. Molly Roberts has a history of trailblazing her own path. After getting her start in psychological evaluation and counseling services - including psychiatric crisis counseling - she received her medical degree from the University of Arizona. She met her husband Dr. Bruce Roberts, while working in emergency psychiatric services.While at Canyon Ranch, they started a radio show on a variety of health topics. They moved to San Francisco and started a rapidly-growing healing center called LightHearted Medicine. Dr. Molly took time out of a busy schedule to discuss some of the secrets to her success. Question: What is the meaning behind the name 'LightHearted Medicine'? Dr. Molly: We named our practice that for two reasons. One, to keep our eyes on the prize for the patients that we are working with. Two, for us to walk our own talk around the concepts of health, truth, integrity, joy, peace, balance, and harmony addressing physical, emotional, and psycho-spiritual health for our patients and ourselves. It's a good reminder for patients and for us that we all have a bigger life story and that there are multiple potential paths to health and happiness. I ask my patients if they are the hero, villain, or victim of their own life story (or the fourth option - not important enough in their own life story to be mentioned). Typically, the universal answer is that people want to be the hero; they want to be in positive control of their lives. The conversation then becomes an exploration of how to create an environment that will make that possible for people. How do you use multimedia to better engage with your patients? Our website's patient portal was designed to make it easier for patients to access the abundance of information on our website and to better communicate with us. We wanted them to be able to just go to one page and find everything they needed. What strategies do you use to get patients to engage with their healing process? It all starts in our first visit. We have an hour and a half together, and I let them know beforehand, I will not be ordering labs during the visit, I will not be writing them a prescription. Really that time is for us to get to know each other, and also for me to hear their story. My feeling is that they have had their entire life to know their life story, and I have this little 90 minute window of opportunity to find out what's going on for them. In more ways than one, I am a medical detective, putting together the puzzle pieces of their life experiences, relationships, etc. I don't have a judgmental bone in my body. The reason for that is that I am so clear that you own your body, mind, spirit, and decisions. I'm there to be of support and to be a partner with them in their care. They control the bottom line. That helps, because then they know that working with me is not a hierarchical process. If there is any hierarchy at all, then they are at the top of that hill. It is their health, and their happiness that we are looking at. How do you make your practice accessible to everyone? We are always looking for ways to leverage our outreach. For instance, our LightHearted Club gives all of our patients' free access to group events that we host. For non-patients, they can join the LightHearted Club and it's extremely affordable because we did not want our medicine to be only for the people who had the most financial means. We want people to be able to get beneficial health information in a way that is easy for them. We are about to start doing group webinars as well, so that people in other areas can gain access to this information. We already do video online visits for those of our patients who find it hard to come into San Francisco for each visit and, as you can imagine, that is a very popular service. What other non-traditional outreach efforts do you practice? We love doing the podcast. Back when we were at Canyon Ranch Health Resort in Tucson, Arizona my husband and I did a radio show for them called the Canyon Ranch Quality of Life series where we interviewed different integrative practitioners. That was such a blast, we absolutely loved it. I've been wanting to do a radio show ever since then, and the podcast fits that bill. It's fun, it's lighthearted, it's informative. We also have a blog, a LinkedIn group, and a Facebook group. The Facebook group is for the general public, and the LinkedIn group is a collaborative discussion group for professionals who are providing integrative care. The idea behind that is to create a forum for all of us health professionals to be living a LightHearted life as well. It is an opportunity to look at what needs to shift and change in your own life in order to be in that space yourself so that you can then be better able to help your patients get there too. Do people have any misconceptions about what you do? Every once and awhile, someone will ask me if we "deal with the hard stuff" my response is that we go right there. We go to whatever is getting in the way of your health and happiness. Doing functional medicine, you see people on all ends of that health spectrum from the people who just want to stay healthy, all the way to the people who have seen every other doctor and are really struggling on their health journey. Those are the ones who need to dive deep and find the underlying causes behind their disease and we are here to help them do so. 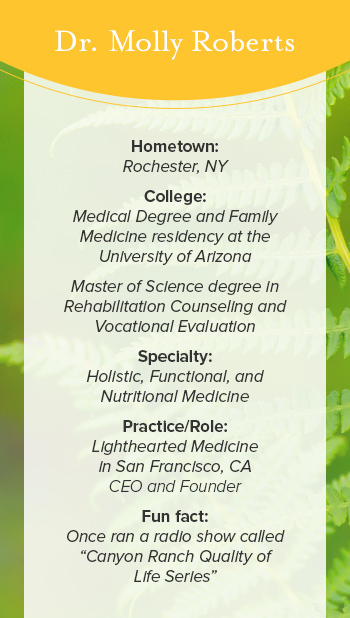 For more from Dr. Molly Roberts, visit her profile page on Integrative Wisdom.